Van Hire Bangkok to Damnoen Saduak, Mae Klong Market (Train Market) and Amphawa Floating Market Day Tour. Private tour of top three exotic market in Thailand: Mae Klong Market (Train Market, Talad Rom Hub or Risky Market), Original Damnoen Saduak Floating Market and Amphawa Floating Market. We offer van hire from Bangkok to visit floating market tour with polite English speaking driver who is expert in Bangkok to Damnoen Saduak, Mae Klong Market and Amphawa floating market one day tour. Our carefully designed itineraries can be adjusted on demand with your van hire Bangkok private tour. To travel with us, you will visit Mae Klong Market (Train Market, Talad Rom Hub or Risky Market) on train schedule, Damoen Saduak Floating market to take boat tour experience and visiting Amphawa river view at the end of program tour. Damnoen Saduak Floating Market in Ratchaburi is one in every of the foremost common floating markets in Asian country. Daily Thai and foreign tourists travel here to buy, eat, and absorb the atmosphere of original Thailand water markets that are like this for over a hundred years. Amphawa Floating Market is one in every of Thailand’s floating markets that is previous and extremely common among tourists. This floating market is additionally one in every of the highest Samut Songkhram’s traveler attractions. Because it's shortly from Krung Thep, each Fri – Sunday the market are packed by the tourists travel to get pleasure from canal side views or having delicious food. For generations, the people of lower central Thailand conducted much of their commerce on the network of canals that crisscrossed their land. It is only in the past few decades that roads have replaced the functionality of the canals. Bangkok had an active floating market once, but this largely disappeared in the 1960s as roads were constructed and vendors moved into modern shopping centers. The demise of the traditional Bangkok floating market within the city. For an authentic Thailand floating market, head south to the town of Damnoen Saduak, moreover this tour will include additional famous Mae Klong Market (Train Market) and Amphawa floating market, you will experience the three exotic market where are famous worldwide. All three extraordinary markets are on many documentary TV program such as lonely planet, national geographic, etc. Tourists from all over the world explore the differentiate Damnoen Saduak, Mae Klong Market (Train Market) and Amphawa floating market tour where you can see this style of market in Thailand only to take photo or share their experience in Youtube for one in a life time experience in Thailand. At Amphawa floating market tour will be different from Damnoen Saduak. The atmosphere of Amphawa floating market is more relaxed and chill-out like a Jazz song that why we arrange Ampahwa river view to be on the afternoon. We recommend you to try various kinds of Thai Food including seafood, Thai desserts, drinking fresh coconuts and shopping for their handmade product and relaxing walk around along the river. You can take this opportunities to shop not expensive in the attached souvenir stalls. 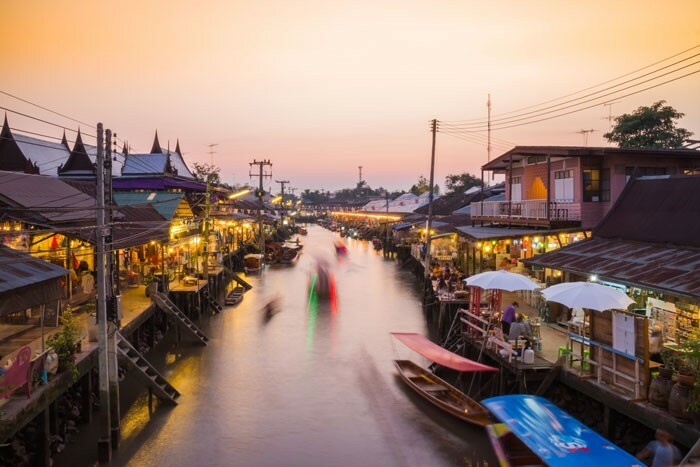 Amphawa floating market hours 2019: 10:00 AM - 9:30 PM on Saturday and Sunday. Amphawa floating market is not fully open in the morning. There is boat tour and some restaurant but Amphawa floating market tour is crowded in the evening and night . Amphawa market are fully opened after 3.00 PM. to experience amazing experience and various delicious food. 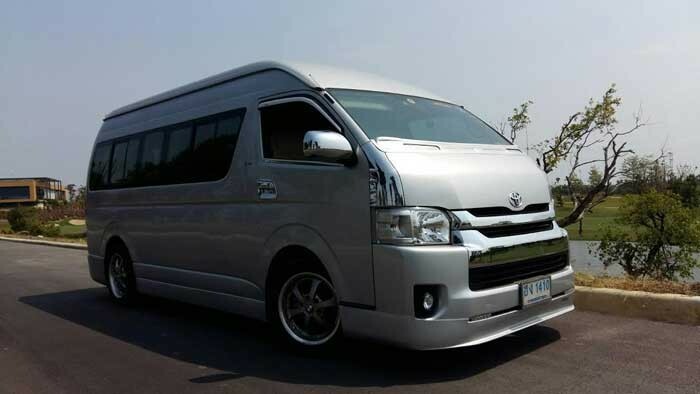 ThaiTourismGuide.com can offer van hire Bangkok to various travel services such as Thailand sightseeing show, Thailand sightseeing tour package, van hire Bangkok with driver, Thailand city tour and tour guides for foreign tourists in Thailand. We can arrange your trip for Amphawa floating market tour, Maeklong railway market for both join tour and private tour. • Is there child/ senior in your group? • Please inform where to go or what you want to do in this trip. If you don’t have idea at this time, please check our Bangkok sightseeing or Day Trip in Bangkok with our link as followed: https://www.thaitourismguide.com/day-trips/day-trip-in-bangkok.html. We also have many activities or attractions in Thailand for other destination such as Pattaya, Phuket, Chaing Mai, Kanchanaburi, Krabi or Hua Hin. If you need any specific information about travelling in Thailand, please feel free to contact us.